I have been thinking about this post for a while, I have wanted to pick a word that I could ponder and incorporate in my life for this year and beyond. I had some great words and last week when I started writing about it, it never materialized... then a few friends gave me suggestions and I would think, oh... that's a good one. Yet nothing would come to me when I would think about writing about it. I spent my Sunday relaxing and catching up on all the blogs I follow... I knew I wanted to write tonight and when I came in to sit down... the word Joy came into my mind.... it's been something I have been thinking about for a while.. I have not felt joy for a very long time and this is the year I want to change that, it all started with forgiving her... I have to say, it feels good, she is still there, doing what she does best but I don't care anymore... what I care about is changing my mind and heart so that I can feel joy again. I have been so wrapped up in what I lost, what I don't have and what I feel the future holds for me that I was unable to see that nothing is set in stone, things change.. that is a part of life. What is the point of me being sad and not feeling joy? After injuring myself in November to the point that I couldn't exercise, I used that as an excuse to question why? Have I not had enough challenges, trials, losses? What was the point of me continuing to take care of myself when it seemed like an injury could come along and take away the little good I felt I had in my life. Believe me, whenever I was stressed I walked, whenever I was sad, I walked... I used walking to avoid my feelings. After being injured I had to start thinking about those feelings ... they were pretty difficult to deal with, so I tried to ignore them and eat. However; that is not acceptable to me any longer, I can't use that as an excuse to not take care of myself.... I started taking care of myself by forgiving her and I have been working on my surroundings, slowly getting that together. Next was the word and I know it is a bit late coming but it finally came to me and I realize it's not just a word I want for 2016... it's a word I want to give thought about for my life. The truth for me is if there isn't joy, what is there? Every last one of us has challenges, things that can drain us emotionally, physically and spiritually... if we don't have something to hold onto to get us through that... how are we to believe it can get better. For me, it is joy... it is much more than happiness.. it's a feeling that is possible even when a trial is happening because I know that no matter how challenging a trial is, joy will be there again. Somewhere along the line I lost that ability to see that as I was in a place I thought I would never get out of... so I questioned how could I feel joy again? Joy never left me, I just had a hard time seeing it. It's such a great word Launna. You have been through a lot and you have accomplished a lot. It can be very hard to forgive I have been there and still going through it. I do tend to hold grudges so it's something I am working on. Yes, so wonderful Launna! Finding joy in the little things is the best place to start. I have a Thank You journal that I keep, and I even gave one to my son. It has helped me so much to find happiness in so many things. Being thankful allows you to reflect on the things you actually have in your life, not what you are lacking. It's a great way to start finding that Joy! Also, reading The Secret by Rhonda Byrne is great for positive thinking. Such a great word Launna! I've decided that I need to be more in control of my happiness. I've been keeping a gratitude journal and writing something every day. Looking forward to hearing about your year of joy! Joy, Such a Lovely word Launna! Totally agre with You darling!!! I Wish You a live full of joy!!!! So true, we all need something to get us through the hard parts of life and to give us the courage and motivation to push through challenges. wonderful post my dear ! Launna, a alegria está dentro de cada um. E não depende de ninguém para brotar e mostrar seu colorido. Viva na beleza que é viver! Beautiful Launna. I love this word for you. I can't imagine what it must have been like to have exercise taking away from you when it was your healing and sorting out time. I guess it's one of those blessings in disguise to have to be still to think. I'm glad you took time to let the word come to you instead of just choosing 'any ole' word. I loved how you explained that joy is so much more than happiness. Ti abbraccio e buona settimana!Ciao! Joy is a great place to start. When you forgive someone you take the power those bad experiences have over you away. I suggest you never speak her name or give her the energy of one of your thoughts. It might start driving her a little crazy but that's her demon to dance with. good thoughts Launna. And agree with what you said. Happy week. It seems like I know you a little with every post and each time you inspire me. Have a joyful life cause there is nothing else that's worth more. Yes, joy is the word! I wish you joy everyday! This is beautiful, Launna! I'm glad you are choosing happiness... you really DO have to choose it!! I am going to make a note to email cute cartoon a meme to you... so look out for my email. Forgiveness is certainly paramount to experiencing happiness. So glad you are there! Have a lovely week pretty! Looks like you're really embracing the new year with a very positive note, I'm so happy for you, Launna. Writing down something that you're grateful for is a great idea, too often we take things for granted so this way we remember all the little things in life that we usually overlook. I totally agree with you. Your posts are always so inspiring. Hope your week is full of joy. Dear Launna, I wish you all the joy in the New Year and in your future, you deserve it! 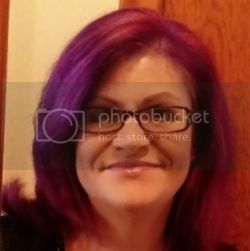 Launna lets every day choose to joy, yups thats good, don't care about her again you have to forgiving her and enjoy your life. Have a wonderful Tuesday, Launna. 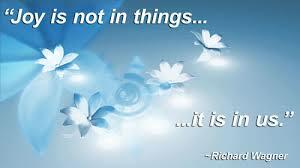 Answers and solutions lie within us; we just need to 'find' them. This is wonderful Launna! The best resolution ever! I really like your line: "The truth for me is if there isn't joy, what is there?" That is so true. Really, joy is what makes everything worthwhile. I think this is a great word to focus on. It is important that we remember that we have the capacity for joy within us, too. Hope you have a wonderful week! Loved this insightful and inspiring post Launna! I'm right there with you. I want to find my joy again by expressing more gratitude this year too. It's so easy to miss out on the good things by focusing on the bad all the time. I think it is a great idea to write about every thing that we are greatful for. This way we can be appreciative of every thing we have and it will also make us understand that we are blessed. Thanks for sharing and I am thankful for having blogger friends like you ! Being grateful is the biggest joy one could feel. You suddenly feel the surge of joy in yourself for when you acknowledge the fact that you are lucky to have all those things others don't have. Gratitude definitely leads to happiness. I also find that service leads to joy, and connecting with you know who, that guy who's always waiting to hear from us. And kids. Kids bring joy. Inspiring. And a joy to read this post. today I've decided joy too dear. Thanks for your nice posts! Amiga que maximo a sua postagem 2016 seja de realização. 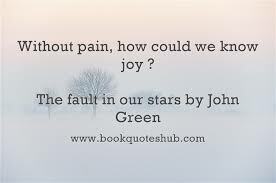 I really loved your last line..but its so hard to find JOY is this brutal winter at the moment. Its great to read your warm words. All the best to your writing and finding that JOY. Smile. Embrace ..I dunno..I think of Joy being that invisible hug... we all nee. I think Joy is a great work to pick and I hope that you are able to find it in 2016! Joy is such a good word, gratitude is another. I also think doing our best to think positive and to be positive is good! Happy friday my lovely friend!!! Yes. A grateful heart can get you through a lot! I love your spirit, Launna. That is what will pull you -- and all of us -- through! Joy is such a beautiful word, Launna, and what's more important, it's an incredible feeling. Actually, I've never thought about the difference between joy and happiness until I read this post. I think your persistance to being a positive person is SO inspiring, even tho you've faced real trials in your life. I loved the idea of writing down something you're grateful for every day, I might start doing that, too! Thanks for the inspiration, my friend! Yes! Joy is within us and i'm happy you have found it. I love to ponder on all the things that I'm grateful for. Writing something down or even thinking something that you are joyous and grateful for every day is such a good idea! Hopefully it helps, Launna! Joy is a wonderful word. So is grateful! I started a 365 Grateful on January 1 of this year. It does make you stop and really appreciate all the wonderful little things in your life. I have a feeling it is one thing I will finish as I love how it makes me feel. Good luck my friend! I'd choose joy for you too Launna considering all you've been through. Joy is surely within us. You are such huge inspiration. 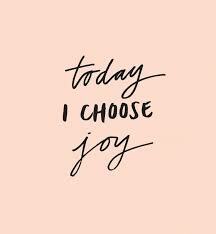 I choose joy. And being grateful gives me that joy. Great post Launna. Hugs and wishes for an awesome weekend. This is a really beautiful post Launna, and the message is really valuable. Your plan of action is really positive and definitely a step in the right direction. I especially like the idea of taking time to feel grateful and remembering the little things that make us happy. I send you a huge hug! I agree with those lines, Launna..."that; Joy never left me, I just had a hard time seeing it." So very true! All we need is to look at life in a little different way- every time we are wrapped up in negative situations and or emotions. The path gets clear (for us) when we wish to see beyond that. Loved to read that you chose "joy" to remain in your life this year! Wishing you more success, smiles and best days of your life. Such a wonderful idea. You deserve to have so much joy!